Confederate General Robert E. Lee’s surrender of his Army of Northern Virginia on April 9, 1865, marked the beginning of the end of the Civil War, but not its official conclusion. Learn where Union and Confederate forces continued to clash in the weeks following Appomattox. News of Lee’s surrender across the border in Virginia reached both armies in North Carolina on April 12. The following day, Union General William Tecumseh Sherman’s cavalry captured Raleigh and pursued Confederate forces under General Joseph E. Johnston west from the state capital. At Morrisville Station, Union troops shelled the town and attacked its train station to prevent the departure of a rebel train carrying supplies and wounded soldiers westward to Greensboro. The Confederate cavalry held off the attack long enough to decouple the rail cars carrying supplies and allow the wounded to escape, but they were ultimately forced to retreat. The following day, a Confederate courier bearing a white flag rode into the Union camp in Morrisville to begin negotiations that resulted in the largest surrender of the war when Johnston’s 90, 000 troops laid down their arms on April 26. Throughout April, Major General James H. Wilson’s Union troops swept through Alabama, seizing Selma and then Montgomery. The next target of Wilson’s Raid was the South’s last major industrial supply center—Columbus, Georgia. Wilson divided his forces and ordered a contingent under Colonel Oscar LaGrange to seize a bridge spanning the Chattahoochee River at West Point, Georgia, 35 miles upstream from Columbus. On Easter Sunday, the day after President Abraham Lincoln’s death, LaGrange’s forces attacked the badly outnumbered Confederates and seized Fort Tyler, a small earthen defense on the Alabama side of the river, before taking the bridge. The attack claimed the life of Brigadier General Robert C. Tyler, who became the last Confederate general to die in battle. As the battle continued at West Point, Union soldiers attacked the trenches, breastworks and earthen forts ringing Columbus. After an afternoon of fighting, Wilson’s forces launched a daring nighttime raid that succeeded in breaking the Confederate defenses. The rebels set fire to one of the two covered bridges spanning the Chattahoochee River between Columbus and the Alabama town of Girard (now called Phenix City), but the Union soldiers managed to cross the other. Wilson’s forces ransacked Columbus and destroyed Confederate armaments, including the still-unfinished ironclad CSS Jackson, which was burned and sunk. Inland in South Carolina—on the opposite side of the state from where the Civil War opened at Fort Sumter four years before—a skirmish broke out between Union and Confederate fighters in Anderson County, where Major General George Stoneman’s Union cavalry was searching for Confederate President Jefferson Davis in the Saluda River valley. 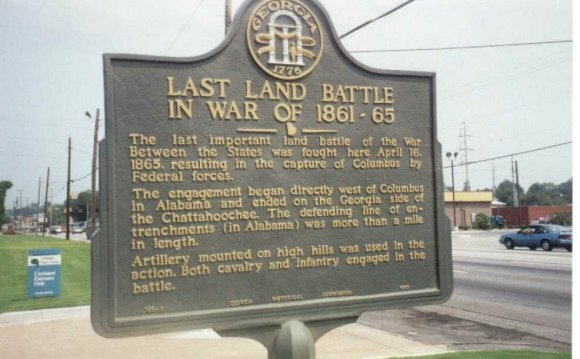 The exact location of the battle is unknown, but it is thought to have been the last exchange of gunfire east of the Mississippi River during the Civil War. The rebels may have lost the Civil War, but ironically they won what some consider the war’s final land battle. Days after Wilson’s forces captured Davis on May 10, Southern forces in the Trans-Mississippi region had yet to surrender. When Union forces left Brazos Island on the far southern tip of Texas and marched inland toward Brownsville along the banks of the Rio Grande, they encountered rebel outposts. With both sides fully aware of the surrender at Appomattox, a force of 350 Confederates under Colonel John Ford defeated 800 Union troops commanded by Colonel Theodore H. Barrett, who narrowly avoided being trapped in a bend of the Rio Grande. Among the handful of dead was Private John J. Williams of the 34th Indiana Infantry Regiment, who is thought to have been the last of the more than 600, 000 soldiers killed in the Civil War. When Confederate General Kirby Smith agreed to surrender his Army of the Trans-Mississippi two weeks after the Battle of Palmito Ranch (also referred to as the Battle of Palmetto Ranch) on May 26, it ended the organized military rebellion against the Union. Where was the Pearl Harbor?